With the speed of business accelerating, you need business tools that are even faster if you want to gain a competitive advantage. Many organizations are turning to SAP HANA for faster analytics and processing capabilities. But if you want to enjoy the benefits of SAP HANA, you need a storage architecture that will enable it to run at full capacity. SAP HANA requires integrated infrastructure that allows all nodes to be on the same network. This white paper can help you build and deploy that kind of infrastructure. 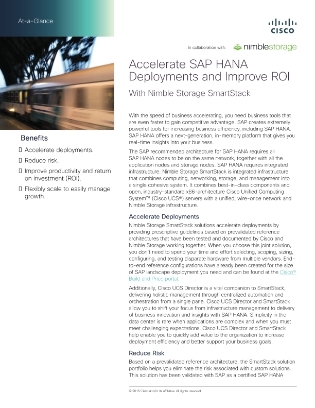 Read on to learn what you need to do to get the most from SAP HANA.